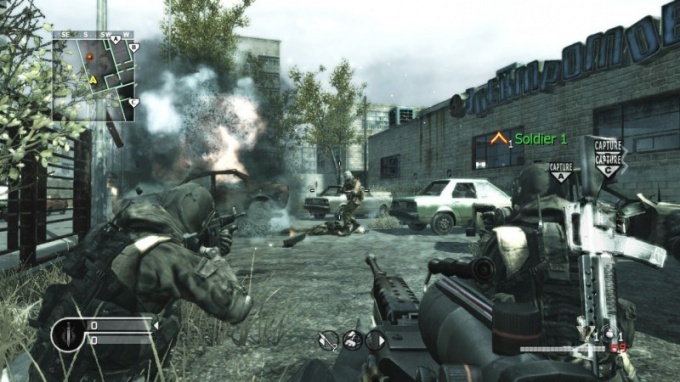 How to escape from captivity in the game "Feat of the soldier"
Call Of Duty: Modern Warfare 4 is the latest computer game, which is part of the popular series of military shooters Call Of Duty. The game is famous for its system requirements, and to run and operate correctly, your computer must meet certain parameters. Among the minimum requirements of the game, the most important parameters is the amount of installed RAM, processor power and installed in the computer video card. The RAM should be 512 MB. The CPU should be not lower than Pentium 4, and operate at a minimum frequency of 2.4 GHz. Use processors from the AMD family Athlon 2600+ and above. If you have a dual-core processor, it will work, however it should work at a frequency of no less than 1.8 GHz. Model of video card should be not lower than Nvidia 6600 or ATI Radeon 9800, while the graphics memory should be more than 128 MB. The game requires 8 GB of free space on the hard disk, a keyboard, mouse and disk drive to install game files from media. To start the game, the computer can be running any operating system since Windows XP. However, to display all the effects that apply in the game, you'll need a more powerful computer. For example, you should be dual-core processor, running at a clock frequency of 2.4 GHz. The RAM should be at least 1 GB, but it is desirable that the strips of RAM for a total volume of 2 GB. For a comfortable game suitable graphics card Nvidia 7800 or Radeon X1800 with a capacity of 256 or 512 MB accordingly. If you have not very powerful computer, you'll need to make settings of the image. To do this, install and run the game using the shortcut on the desktop, and then go to "Settings" - "Graphics". You can manually adjust the display settings to match the system. To apply the changes, restart the game and then go to the "Campaign" to test the graphics performance. If there are some slow downs that hinder the game, you'll need to reduce the graphics settings for a more comfortable game. To successfully run the game you can use the option of automatic configuration of the desired parameters by clicking on the appropriate menu item under "Settings" - "Graphics". Key parameters when setting up the display quality are used, the resolution and quality of textures. If the game really runs slowly, you'll need to change these settings. If necessary, you can reduce the resolution of the secondary elements such as water or reflections. These parameters do not seriously affect the image quality, but they will help significantly improve performance and reduce stuttering in the game while displaying images of modern warfare (modern warfare).